Humour me: what colour is the smartie? One of your most captivating litter shots ever. Love the bright red against the dark pavement, and the contrast in textures, smooth versus rough. The diagonal lines of the pavement add interest as well. Very arresting! Thanks, Allyson. I like the textures too. And the itty bitty shadow. BUT… I see it as orange. (In fact it is/was orange.) So what’s most interesting to me now is why you see it as red. Is it your screen or just ‘your’ personal colour-take? I love when this happens, when someone sees a thing as green and someone else sees it more blue, etc. Are you just being a Smartie? Or is it an M&M moment? I love the stark minimalism of this photo Carin. 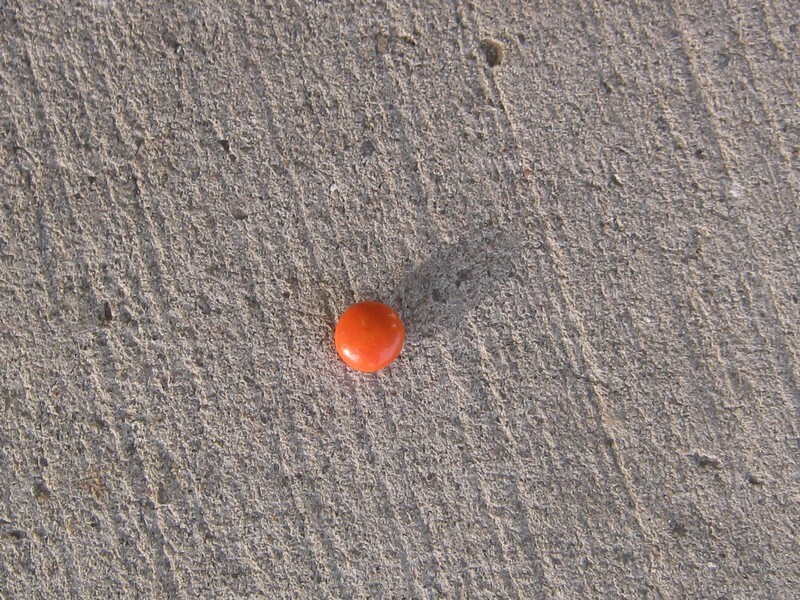 I thought it was a mini tomato but now I read your comment, I’m sure you’re right, it’s a smartie. I love it too. How does something so simple work so well and give the viewer such pause? What struck me was the hmmmm factor… i.e. did someone drop this and then decide it wasn’t safe to pick it up? Or maybe they didn’t even know they dropped it. (Saddest possible option.) Or maybe they were in a high-powered walking meeting at the time and didn’t want to appear pathetic. Of course I like this option best. At first I thought the “shot” of orange was a Rowan berry dropped by a passing bird. But on closer inspection I see this is a more candied shot. I hope the story is not that the next passing pedestrian will crunch it under foot. Lovely and provocative as always, Ms. M.
Ouch! I didn’t even consider the crunch factor.